Reliable designs and as-builts require an accurate representation of existing conditions. A single High Definition Survey or 3D Laser Scan builds an accurate foundation that enhances Spatial Representation. With the addition of laser scanners to our field surveying methods, we are able to accurately collect a tremendous volume of detailed survey data. Providing significant cost reduction to our clients by increasing the productivity of field crews and expediting the work-schedule by reducing the need for encroachment permits and minimizing physical footprint into potentially hazardous conditions. Especially effective in topographic survey and mapping applications; transportation corridors, tunnels and bridges; complex pipe networks; electric substations and transmission structures, as well as intricate and detailed architectural structures; all of which previously have proven a daunting task to survey, are now easily scanned and translated into a three-dimensional CAD environment. 3D Laser Scanning is becoming an integral part of almost every topographic survey project, reducing costs and providing significantly superior quantity and quality of topographic survey data; office technicians are often able to find detailed information in the scan point cloud that otherwise might have required additional field survey. 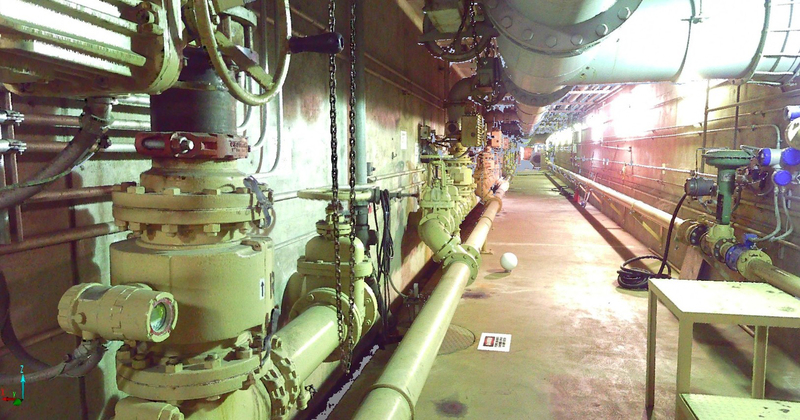 WestLAND group performed laser scanning through 4 acres of Mitsubishi Cement facility in order to obtain as-built information of their existing facilities and to help facilitate construction for improvements to their existing facilities. WestLAND also facilitated scanning of the inside of the preheater tower for their 30 foot diameter pipe that preheats materials for combustion. WestLAND provided a point cloud of 30+ scans and 3D modeling of the existing structural beams in order to facilitate the design of a new catwalk near their kiln sampling access hatch inside the preheater tower. The scan data was delivered to the engineers in .E57 format and the structural components were delivered in Autodesk Revit format. Location: City of Industry, CA - WestLAND Group provided Laser Scanning, and 3D modeling to provide our client with information needed for a building redevelopment project. Laser scanning and Autodesk Revit was utilized to create a 3D model of the existing exterior “shell” of a complex building, which was used for BIM and to support redesign of the exterior for ADA compliance and facade renovation. The client requested detailed 3D models of their entryway and windows which provided an opportunity for WestLAND to demonstrate its superior 3D modeling capabilities. Services included boundary and topographic surveying, mapping, laser scanning, 3D modeling in Revit, and BIM support & management. The Sanitation Districts of Los Angeles County contracted the WestLAND Group to provide high resolution surveying and scanning of the Los Coyotes Water Reclamation Plant in Cerritos. The underground galleries needed to be mapped at a precision high enough for their engineers to perform electrical conduit routing designs and conflict analysis. The WestLAND survey crews tied into existing 3D site control, established new control underground and scanned approximately 550 feet of tunnels and galleries in one day rather than the estimated 5 to 6 days using traditional survey techniques. WestLAND personnel then took the raw data from 27 scans, brought it into FARO Scene software registering the 3D point cloud to meet the 6mm (0.02’) precision, and exported the required POD and E57 files for the clients use. A full survey control report accompanied the large data set on a thumb drive for delivery. The final product is saving the client numerous expensive trips to the field to capture measurements; now the client simply opens the 3D point cloud and makes measurements at their desk.